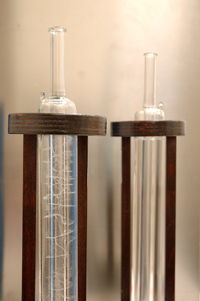 The unit of temperature Kelvin (K) is realized in the laboratory using a set of water triple point cells. The International Temperature Scale of 1990 (ITS-90) is realized using a set of fixed point cells covering the range of -189.3442 ºC to 1084.620 ºC. The comparison calibrations cover the range of -80 ºC to 1200 ºC, depending on the type of the thermometer to be calibrated.